! - İzdihër - ! : Fight of the century. Boxing viewers or anyone who watched Saturday night's Pacquiao v/s Mayweather fight which was held at the MGM Grand Garden Arena in Las Vegas on T.V or live, dubbing the whole match as more sorta Dancing With The Starts entertainment show than Fight of the century as it was supposed to be. Well, of course! Now a days boxing is no more boxing of Mohamed Ali and Jo Frazier, or of Tyson and Holyfield. Gone are the days of Heavy weight boxing. Gone are the days of knock outs. Gone are the days of ear biting. It is all business now. However, today's fight was extra hyped no doubt with the celebrities present in the audience, tweeting live, cheering and rooting for their favorite man. It was utterly underwhelming to be honest in the end. But still, on a positive note, all that hyped has somehow brought back the world of boxing in the spotlight that it hasn't been in for a long while and THAT might be the true benefit. I hope the sport slowly climbs back to the limelight. Actually, one of the reasons of the whole thing did not live up to the hype was that majority was rooting for Pacman and literally declared him the champ even before the fight. After the event his fan boys and girls are still unable to accept that Maywaether won without any mark on his face, and took home a lots of moolah with him despite being not so favorite. It was sure quite a big fat disappointment for them. In Pacman's own word's, " I thought I won the fight. Says Mayweather "didn't do nothing," just ran. AP Sports. Well, there is no harm in thinking, but he and others need to understand that Maywather was extremely elusive and cautious in this bout as against him. On the other hand, he whether one like it or not, was just throwing inaccurate punches and jabs whereas Mayweather was on point in terms of accuracy and precision on both counts. Pacman wanted to take the fight to Mayweather with his usual speed and constant aggression but was completely obliterated by a Mayweather's tactical master plan. As he's known for poignant defensive tactics and has a ferocious counter attacking techniques that's almost unstoppable. Mayweather really exploited his known tactics to his advantage as he didn't allow Pacman the space to attack him, that's how come Floyd Mayweather outclassed and outboxed him with pure technical and tactical expertise. 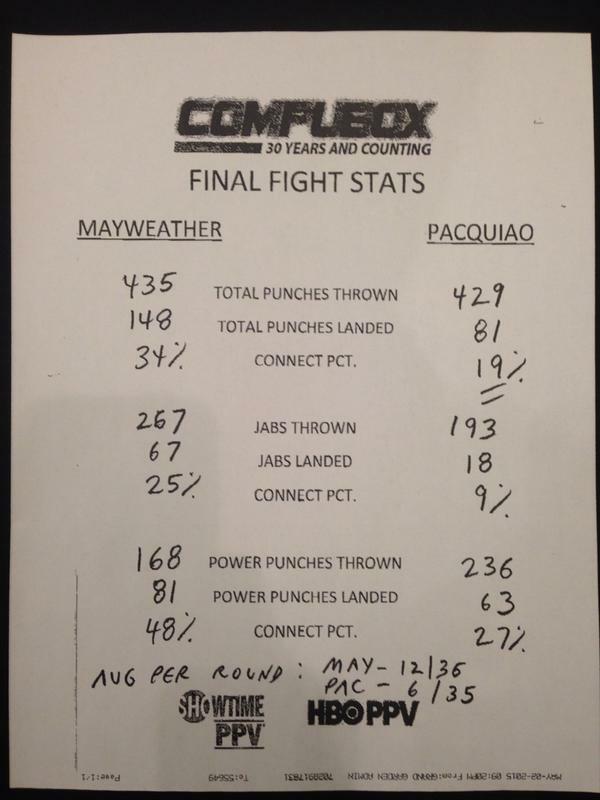 And according to that final fight sheet: May thrown some 435 punches from which 148 landed, whereas Pacman thrown 429 punches from which total 81 landed. Rest, you are not blind , can read and see perfectly by yourself that how much jabs and power punches he thrown and how much from them landed as compare to Pacman's. Pacman also didn't show us his true masterclass and the fact that he was reluctant in closing down Mayweather when got the chance. Had he done that, it would've been a completely different verdict. One can rooting for whoever one wants to root for, but we also can't root players for their reputation, color, religion and personal lives. What they do/did in the ring, matters most. Who they are in real, what they do in their private lives is their business. Calling Mayweather: wife beater, road runner, and cheater is not gonna make Pacman win. Match is over now, so stay calm and accept the fact that today was Mayweather's day. He played well and won with improving his career record to 48-0.